The U.S. Senate has confirmed President Obama’s nomination of Leslie E. Kobayashi, currently a federal magistrate judge in Honolulu, to serve as a district judge on the U.S. District Court for the District of Hawaii. Judge Kobayashi, 53, was confirmed on Saturday on a voice vote of the Senate. She is expected to receive her commission shortly and will fill a judgeship vacant since June 30, 2009, when U.S. District Judge Helen W. Gillmor took senior status. Judge Kobayashi has served as a magistrate judge for the District of Hawaii since Aug. 2, 1999. Prior to her appointment to the bench, she engaged in private practice as an associate then partner and managing partner at the law firm of Fujiyama, Duffy and Fujiyama from 1984 to 1999. She served as a deputy prosecuting attorney for the City and County of Honolulu from 1983 to 1984. 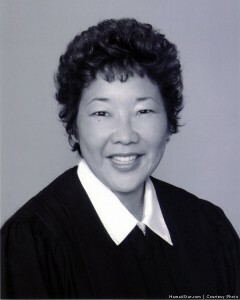 Judge Kobayashi received her undergraduate degree from Wellesley College in 1979 and her law degree from the Boston College School of Law in 1983. Judge Kobayashi serves on the Ninth Circuit’s Alternative Dispute Resolution Committee. She served on the Ninth Circuit Judicial Conference Executive Committee from 2008 to 2010, and as vice-chair of the circuit’s Magistrate Judges Executive Board from 2006 to 2008. The U.S. District Court for the District of Hawaii had 1,024 case filings in 2009. The court is authorized three permanent and one temporary judgeships. Federal district court judges, appointed under Article III of the Constitution, are nominated by the president, confirmed by the Senate and serve lifetime appointments upon good behavior. Their current annual salary is $174,000. Another Liberal judge in the most liberal land of America. Swell. Garbage in, Garbage out.